SF Marina has built pontoons and floating breakwaters internationally for a range of bespoke marinas designed to suit local conditions worldwide, from a fishing station in the north of Iceland to the sunny but continually storm-hit Caribbean. The company has leveraged this experience for the Donsö Harbor Association in a project called Donsö Djuphamn – the Donsö deep water harbor project. “This project will benefit the fishing and commercial fleets, but it will also benefit other marine traffic such as official vessels. The main aim is to get our fishing vessels back home, which are over 50 meters in length and have a draught of 7 meters. And, of course, other commercial operators will also have the opportunity to land. We will also be going round to the other players in the region who are limited in terms of accepting the larger fishing and commercial vessels. We will be able to offer them a berth at Donsö,” explained Jonas Backman, Chair of the Donsö Harbor Association. Here, the depth is 17 meters, which means that it is possible to accept vessels with a draught of 10–12 meters – as opposed to other islands in the area where the maximum limit is set at 6 meters. “It is not just that it would be very difficult and costly to build a 10 meter high pier at this location. There is a significant difference between a floating pontoon and a permanent pier as far as the impact on the environment is concerned,” said Michael Sigvardsson, CEO at SF Marina. Floating pontoons of this size gain a protective breakwater effect, and spaces are created beneath the pontoons that provide the conditions for small fish and plants to thrive. The main pontoons are 100 × 10 meters, i.e. 1000 m2, while the ‘gangplank pontoon’ is 25 meters in length. This provides 100 meters of pier on the outside, 95 meters on the inside and 35 and 10 meters, respectively, on the sidewalls – a total of 230 meters. Each 25 × 10 meter pontoon is 1.80 meters tall and weighs almost 200 metric tons, i.e. almost 800 metric tons for the main pontoons. “The whole of this is anchored using an anchor weighing a total of 360 metric tons and 800 meters of 50 mm diameter cable. This means that you need to watch your step, both when doing the calculations and when performing the installation,” said Stig Jansson, Project Manager at SF Marina. 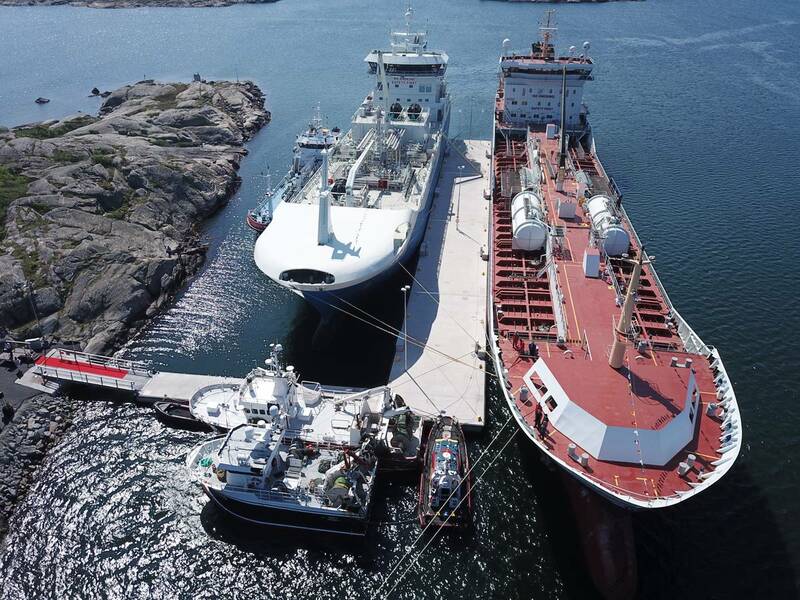 Everything has been manufactured at Wallhamn, Tjörn, which is the site of SF Marina’s production plant, and then transported in several parts to the Gothenburg archipelago. The installation was opened on 18 May, with speeches from, among others, Ann-Sofie Hermansson, Chair of the Municipal Executive Board in Gothenburg. So far, Donsö’s new harbor has managed to find four regular customers, all fishing vessels with home ports in Denmark. The positive financial effects that will come once supplies, equipment, diesel and everything else are bought on-site will provide the conditions for Donsö to be alive all year round. More berthing also means that the Donsö shipping companies’ own tankers will be able to come home for viewing and maintenance, instead of being repaired in Denmark and other harbors. However, the 130 meter pontoon is just the beginning. The vision is for a further two times 130 meters of berthing so that a total of 600 meters can be offered, including both sides. This would allow significantly larger boats to be accepted.